Show the desktop is the President of the Senate has area of 330 square meters and a height of 11 meters. It is decorated in classic style, the walls are paneled with walnut wood carved items and composite-style pilasters with capitals. The ceiling is richly ornamented with decorative elements of classical architecture, made of plaster and patinated. The shaft is a fireplace lounge marble Alun. Is coffered ceiling with ornate soffits, stucco and framing complex. Interior doors are solid oak, hand-carved floral decorations. Decorative flooring contains geometric designs of essences of oak, maple, cherry and mahogany. Furniture made of walnut and walnut veneer root in harmony with wooden decorations of the walls, take the components of the paneling. Structure chandeliers and appliqués are cast brass and crystal products from Medias. 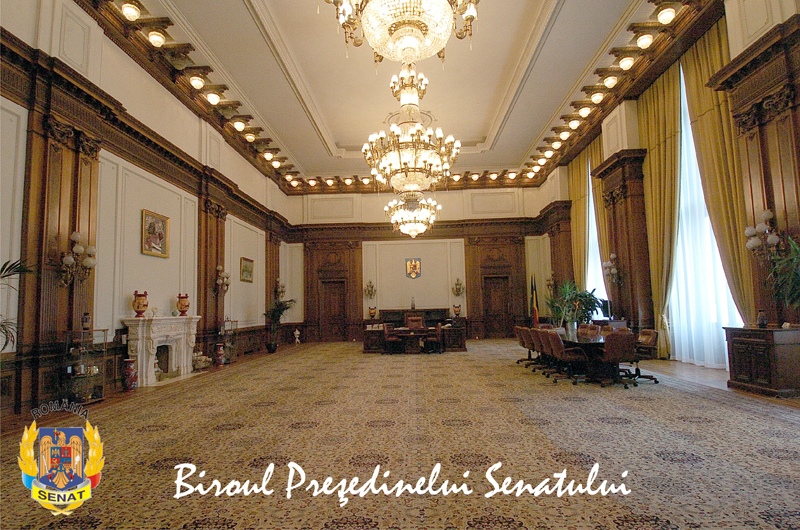 Carpets of wool, both from the cabinet and most other salons in the Senate, were made to Cisnădie, initially in small pieces, which were then assembled on the room size. Original construction and layout of the hall were completed in 1995, when he was employed with the office work destination IPU President, during the conference sessions held at the Parliament Palace. 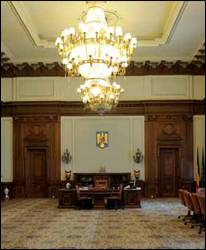 In the interval between removal of the Chamber of Deputies in the Parliament House and the Senate (1995-2005), the room was used as the main hall of Parliamentarians Club, a club founded on the then Vice-President of the House proposal, Ion Ratiu.In these room take place meetings with ambassadors and receipts of more limited character.